Good Spacemusic suggests the possibility of escape from finite existence. Telomere, the extraordinary Electronic Musician Chris MacDonald, is working towards this ideal. With his fourth CD Lux Primordia (56'52") he continues to realize works for the future - in hopes that others will too. Built from wide flat areas of sound, the sonic shapes and forms that make up these seven compositions did not come to MacDonald unbidden. For many years now he has been using his Serge modular system to synthesize sounds into vast cerebral soundscapes on a level with that of the notable classics Ancient Leaves, Planetary Unfolding and Morning Jewel by fellow Serge user Michael Stearns. 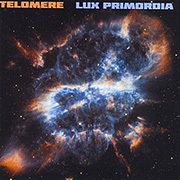 Lux Primordia has been crafted out of sustaining tones, consonant harmonies and a slowly revealing timbral development. Throughout this album there are plenty of rumbling sound masses and deep drones, but also we find an interesting variety of long-held chords and progressions. Although accidental melodies arise out of the random pulsing of two oscillators or a resonating filter set to infinite sweep, this work is meant to be as enigmatic as the Universe it is trying to depict. Critics of EM say it is too vague, providing nothing to identify with - and without overt melodies or rhythms Lux Primordia may seem like an overfull emptiness. This music may not satisfy those seeking highly charged drama or tidy resolutions. The most it hopes for is to transform listeners from simple consumers into critical thinkers.